We hope you have enjoyed Wild Turkey Month – 30 Turkeys and 30 Days as much as we have. We learned much along our journey, with significant reward coming by way of 30 different bourbons sampled over the course of the 30 days. We haven’t been able to provide any conclusions as to which floors or warehouses make the best single barrel bourbons, but resources exist for that sort of study. Nor can we tell you definitively which Wild Turkey bourbons are the best all time – resources exist for that as well. But what we can tell you is our overall observations about Wild Turkey. Here are our five takeaways from the past 30 days. 1. Wild Turkey is underrated. In today’s environment, Wild Turkey seems largely forgotten and ignored. For those of you who have already figured this one out, cheers to you, as you have been fortunate to purchase bourbon that arguably competes at the top of a broad range of product categories, at reasonable and affordable prices. Today, practically every Buffalo Trace bourbon is allocated. Brown-Forman, or at least the Old Forester arm, is getting amazing reviews as of late. Jim Beam gets away with threats of dramatic price increases and discontinuations, yet doesn’t seem to suffer. Heaven Hill drops age statements on products like Elijah Craig, but manages to see 30% growth rates. I could go on. I’d argue that Wild Turkey 101 competes strongly in the $20-$30 category, and Kentucky Spirit competes strongly in the $40-$50 category. Rare Breed is one of the most approachable barrel strengths in the market, and a relatively strong buy in the $40 price range. Master’s Keep Decades finally received some appreciation from Whiskey Advocate naming it third best whiskey of the year, but I still see it on the shelves at more than a dozen local stores. Again, I could go on. Despite this, rarely do I see any hype around Wild Turkey products, or at least the modern ones. We are guilty too – in our now nearly five year history of Flight Club, we have reviewed only one bottle of Wild Turkey as a group. Wild Turkey sits on shelves and collects dust. I could walk out today and find 10 year old Wild Turkey bottles on the shelf – some of which are really amazing whiskies. Yet my local liquor store can’t keep standard Buffalo Trace or Weller Antique on a shelf. Consumers are entitled to their preferences, but I’d suggest more people give Wild Turkey a fair shake. It is really good stuff. 2. Wild Turkey can be incredibly inconsistent. I’ve spent the last few paragraphs blaming consumers for their unfair lack of love for Wild Turkey. But truth be told, Wild Turkey is largely responsible for these issues. We know over fairly recent years that Wild Turkey has changed barrel entry proofs at least twice. Wild Turkey has utilized different warehouses that often age whiskey very differently. In point #5 below, we talk about other reasons for the changes in Wild Turkey flavor profiles over time. All these together result in product that tastes sometimes dramatically different from year to year. Over time, we would conclude that the products today don’t compete with those of yesteryear. But not only have changes over time resulted in different quality of product, but Wild Turkey can’t seem to even release consistent product when not impacted by those changes over time. Take our Wild Turkey Kentucky Spirit single barrels, for example. If you read each of those reviews, not only do you see large swings in scores, you will find tasting notes that seem to describe very different products. Russell’s Reserves follows this as well. Finally, labeling is another issue. We haven’t addressed this much, but Wild Turkey seems to change product labels faster than its bottles move off shelves. While it may be subconscious, changing labels can often create varying perceptions of product. Why does Wild Turkey choose to add to its struggles in this regard? 3. Store Picks are where it’s at. Above we discuss Wild Turkey Kentucky Spirit and Russell’s Reserve Single Barrel having vastly different profiles from bottle to bottle. Our experience with both, however, is that you will have a much better shot of finding an incredible bottle with a store pick. While some store picks might be a “fail” (hence, Wild Turkey’s inconsistency), the chance of picking a truly incredible bottle seems to be greater with Wild Turkey than with many other distilleries. Just our opinion. 4. What’s with the no bottom shelf? Most other distilleries seem to have a “bottom shelf” bourbon that seems to be used to offload off-profile or under-performing barrels. These products seem to be large-batch, low proof products (where inconsistencies can be blended and diluted out), produced at incredibly low prices, and produced without much concern for quality. As examples, Buffalo Trace Distillery has Ancient Age and Benchmark; Heaven Hill has many such as Henry McKenna (brown label), Cabin Still and Old Style Bourbon (white label); and Four Roses has Yellow Label. Wild Turkey doesn’t offer such a product. Its low end offering, the 81 proof Wild Turkey Bourbon, is generally higher quality than these bottom-shelf bourbons, but is priced at a level higher than the others. The higher proof Wild Turkey 101 is their lowest end higher proof bourbon, and it is an undervalued even at the higher end of that next price level from bottom-shelf. Why is this then an issue? Sure, we would like to see some even lower priced quality Wild Turkey (like we love Benchmark for cocktails as a lower-priced Buffalo Trace). But more than this, we would love for Wild Turkey to have a place to offload off-profile or under-performing barrels. 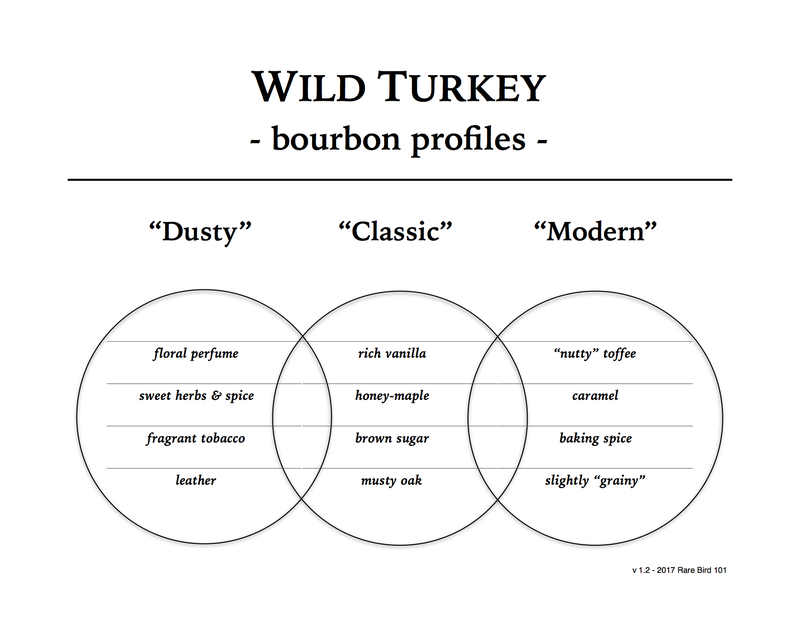 For us, it seems that Wild Turkey is the least particular distillery in terms of selecting single barrels. And it may be that they are largely without choice. Sure, if a barrel destined for Kentucky Spirit turns out off profile, it can be blended and diluted to Wild Turkey 101 (assuming it is high enough proof). But this only goes so far to protect product quality. Turkey seems to instead use what they have, often without regard to profile or quality. Again, just our opinion. 5. Old Wild Turkey deserves its reputation. We discuss above that changes in barrel entry proof and Wild Turkey’s utilization of different warehouses have caused us to conclude that the products today don’t compete with those of yesteryear. These older Wild Turkey bourbons – whether following a “dusty” profile or a “dusty/classic” profile – are just much different than today’s “modern” profile. Bottles like our Rare Breed W-T-01-99, the Wild Turkey Kentucky Legend “Donut” and even some of the older Wild Turkey 80 and 101 bottles might not all be truly “dusty” but are a step above what we see today, and deserve their reputation. Whether or not Wild Turkey can return to this profile, we can agree that if you find old Wild Turkey on a store shelf, buy it!